Projects cannot resell items or offer rewards not produced by the project or its creator. There have been a few cases in the past where this has popped up. Last year there was the Ambiolight and earlier this year there was the machined gamers dice -- both of which were called out by people in the comments as being mere reselling of products made by others already on the market. It appears that others keep trying to do these kinds of reseller setups, tricking users along the way. A few weeks ago, I saw the projects for "Full of Fuel" external batteries. I have a bit of an obsession with external battery packs, and have been personally using a fantastic Anker Astro Pro 20,000mAh battery -- which looked nearly identical to one of the Fuel of Fire batteries. The other two Fuel of Fire batteries also looked like other external batteries already on the market. Thankfully, plenty of people started pointing out similar things in the comments. The guy behind the project initially defended it, claiming that they had "changed the design" but many didn't believe it. The guy behind the project apparently promised to send a sample to one of the most vocal critics to prove that it was different... but then stopped responding altogether, and the project was cancelled (apparently by Kickstarter). 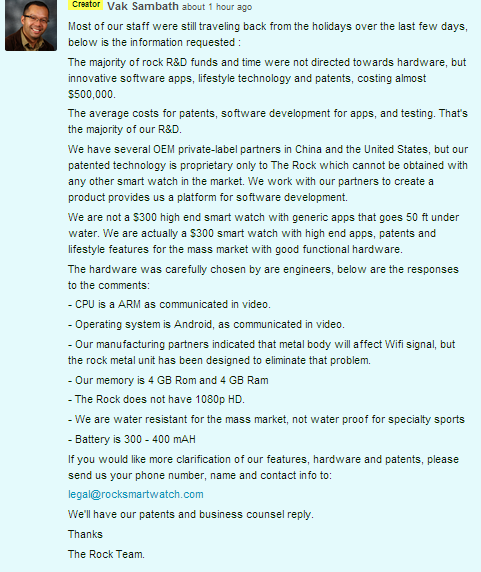 It appears that something similar is happening with the so-called Rock Smartwatch, which launched with a bit of hype, including some odd claims such as that the watch had 1080p resolution (huh? on a watch?!?) and 4GB of RAM. Some folks quickly pointed out that the watch appeared to be nothing more than a rebranded Z3 watch from China. There was a fair bit of evidence to support this. 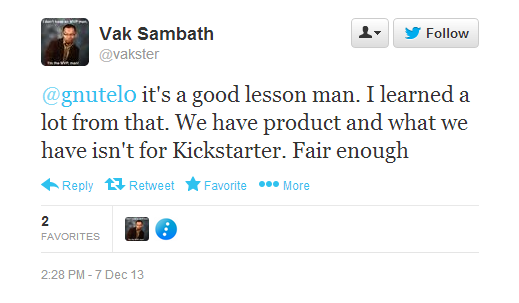 The creator of the project, "Vak Sambath" first started claiming that he was devastated and suggesting that their manufacturing partner had somehow leaked or made different versions of their work. Then he started posting a bizarre "defense" in which he claims to have been "in conversations with our engineers, manufacturers and designers" to then explain why it's different than the Z3. This comment got posted a whole bunch of times... and it also seems to claim that all their work has really been focused on software, suggesting that perhaps they were just using standard Chinese watches and rewriting the software. Of course, if that were true then they should have said so upfront, and his previous claim that seeing the same design elsewhere devastated him and was because of someone in China leaking the designs makes no sense at all. Keep that in mind, because as this story moves forward, there are more and more things that "make no sense at all." Hey Guys... first and foremost... I'd like to apologize for whatever happened to do. It wasn't me. I wasn't in front of my computer all day. Someone got into my account. When it rains it pours guys. This is the real Vak. My account got hacked from some freaking hot mess reason. This hasn't been easy. We appreciate kickstarter for allowing small companies to enter new markets with new ideas, that may not be popular with a small sector that does not like change. The rock is taking a more innovative approach that some may find hard to understand since it is a new direction. He also keeps talking up patents that the company has, which supposedly distinguishes the watch from its competitors. Except when people in the comments asked him which patents Vak responded by claiming the patents were proprietary so he couldn't share them and telling critics to contact the company's lawyers. Uh, that's not how patents work. If you have a patent it's public. That's one of the key points of a patent in the first place, to disclose to the public. It's possible that they have patent applications that haven't been published yet, but having an application is very different than claiming you have a patented technology. Then there's his attempt to explain why he won't give a straight answer, claiming that if you email his legal team they'll give answers but that "the comment section is not an appropriate platform to voice speculation, since there are many experts as pyntail,engineers and large companies involved." I've read this comment over and over again and it's totally nonsensical. First of all, the comments are exactly the right platform for backers to ask these kinds of questions to make sure they're not getting scammed, and no one's asking him to "speculate," but rather to answer some basic questions concerning the product he claims to be selling. How could anyone think it's appropriate when being quizzed about questions on your own product that only you should be able to answer, to instead claim that it's inappropriate to engage in speculation. And, um, if there are many "experts" then that seems like all the more reason to have a full and open discussion. 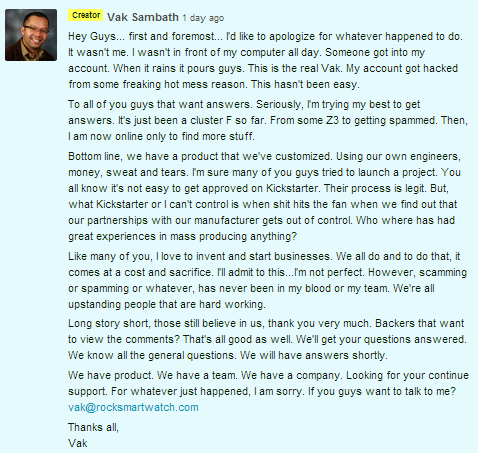 On Saturday morning, things took an even weirder twist, as Vak suddenly decided to just start posting over and over and over again in the comments pretending that they were getting lots of "great encouragement" from their backers, and those backers were asking questions. So he started answering them, but each time he posted, plenty of critics just kept commenting about Vak's own ridiculous claims and calling out that the whole thing was a scam. And rather than respond, Vak just kept posting the same exact "email answers" over and over and over and over and over and over and over again, perhaps in the faulty belief that this would somehow drown out all those calling him out. Accordingly, all funding has been stopped and backers will not be charged for their pledges. No further action is required on your part. Either way, I expect we'll see more of this sort of thing happening over time, but it's kind of neat to see the community itself work all of the details out and help out these questionable projects (even as it's funny to see the project creators try to tap dance around their claims). The Clock Is Ticking: Get Your Copy Of CIA: Collect It All On Kickstarter! 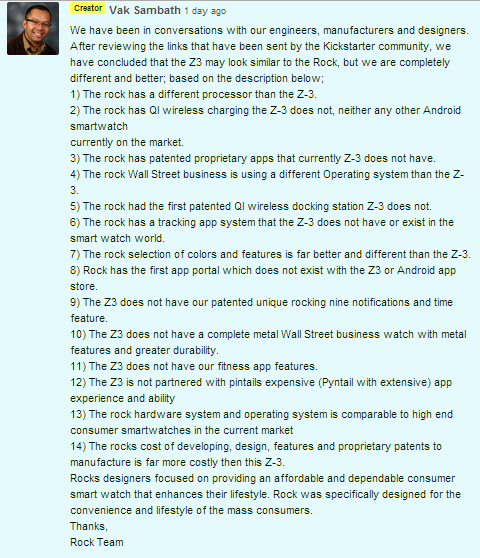 Re: Re: But Kickstarter disclaims all responsibility as a "platform". One presumes the people who use Kickstarter are forced to do so by the evil government, etc. Wait, what? They're not? And they're not giving up any rights to or ownership of their work? Oh, right. They can't be that bad, then, can they? People have chosen to use a service that works for them. Go for it, I say, and good luck to them and to Kickstarter.